Difference between revisions of "Alexanderwohl (Molotschna Mennonite Settlement, Zaporizhia Oblast, Ukraine)"
The Alexanderwohl Mennonite village and congregation originated in 1821 when twenty-one Mennonite families left their home community near [[Schwetzer Niederung (Kuyavian-Pomeranian Voivodeship, Poland)|Schwetz]] and [[Culm (Kuyavian-Pomeranian Voivodeship, Poland)|Kulm]] on the Vistula River to settle In [[Ukraine|Ukraine]]. The settlement near Schwetz was known as [[Przechovka (Kuyavian-Pomeranian Voivodeship, Poland)|Przechovka]] or Kleinsee<em>. </em>Exactly when this settlement and the congregation here originated is unknown, although 1640 is date of the first lease of Prechowka by Mennonites. Presumably the congregation started around that time. The church register was started in the 18th century by Aeltester Jacob Wedel, who was Aeltester from 1754 to 1791. This church record is in the possession of the [[Alexanderwohl Mennonite Church (Goessel, Kansas, USA)|Alexanderwohl Mennonite Church]] in [[Kansas (USA)|Kansas]]. The title page reads: <em>Die Erste Stamm Nahmen Unserer Bisher so genante Oude Vlamingen oder Groningersche Mennonisten Societaet alhier in Preusen. </em>The record begins with a list of names common in the congregation at that time and occasionally states from where the bearer of the name came. Some of the more common names in the church record during the seventeenth and eighteenth century are [[Becker (Bekker, Backer) family |Becker]], [[Buller (Büller) family|Buller]], [[Cornelsen (Kornelsen, Knels, Cornies, Cornelius, Cornelis, Corneliessen, Cornels, Knelsen, Korniesz) family|Cornels]], [[Decker (Dekker) family|Decker]], [[Dirksen (Dircksen, Dirks, Duerksen, Derksen, Doerksen, Dercksen, Dyrksen, Dirssen, Dirck, Dircks, Derks) family|Dirks]], [[Funk (Funck) family|Funck]], [[Janzen (Jantzen, Janssen, Jansson, Jansen, Johnson, Jansz, Janz, Jantz, Jans) family|Jantz]], [[Isaac (Isaak, Isac) family|Isaak]], [[Koehn (Könn, Koen, Kuehn, Kien, Kane) family|Koehn]], [[Nachtigal (Nachtegaal) family|Nachtigahl]], [[Pancratz|Pankratz]], [[Penner family name|Penner]], [[Ratzlaff family|Ratzlaff]], Richert, [[Schellenberg (Schellenbarg, Schöllenbarg, Schellingbarg, Schellenberger) family|Schellenberger]], [[Wedel (Wedell, Weedel, Wedler, Wiedel, Wadel) family |Wedel]], [[Frey (Frei, Fry) family|Frey]], [[Schmidt (Schmid, Smit, Smet, Schmitt, Smith) family|Schmidt]], Sperling, [[Unruh (Unru, Unrau, Onrouw) family|Unrau]] and [[Voth (Vooth, Voodt, Vodt, Voht, Voet, Vogt, Foht, Foth, Fogt, Fodt, Foot) family|Voth]]. Most of these names are still common in the Alexanderwohl community in Kansas. The Alexanderwohl Mennonite village and congregation originated in 1821 when twenty-one Mennonite families left their home community near [[Schwetzer Niederung (Kuyavian-Pomeranian Voivodeship, Poland)|Schwetz]] and [[Culm (Kuyavian-Pomeranian Voivodeship, Poland)|Kulm]] on the Vistula River to settle In [[Ukraine|Ukraine]]. 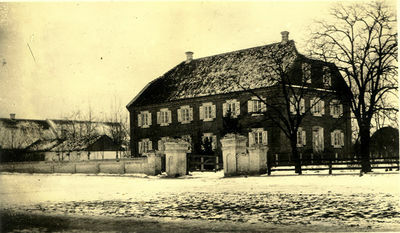 The settlement near Schwetz was known as [[Przechovka (Kuyavian-Pomeranian Voivodeship, Poland)|Przechovka]] or Kleinsee. Exactly when this settlement and the congregation here originated is unknown, although 1640 is date of the first lease of Prechowka by Mennonites. Presumably the congregation started around that time. The church register was started in the 18th century by Aeltester Jacob Wedel, who was Aeltester from 1754 to 1791. This church record is in the possession of the [[Alexanderwohl Mennonite Church (Goessel, Kansas, USA)|Alexanderwohl Mennonite Church]] in [[Kansas (USA)|Kansas]]. The title page reads: <em>Die Erste Stamm Nahmen Unserer Bisher so genante Oude Vlamingen oder Groningersche Mennonisten Societaet alhier in Preusen. </em>The record begins with a list of names common in the congregation at that time and occasionally states from where the bearer of the name came. Some of the more common names in the church record during the seventeenth and eighteenth century are [[Becker (Bekker, Backer) family |Becker]], [[Buller (Büller) family|Buller]], [[Cornelsen (Kornelsen, Knels, Cornies, Cornelius, Cornelis, Corneliessen, Cornels, Knelsen, Korniesz) family|Cornels]], [[Decker (Dekker) family|Decker]], [[Dirksen (Dircksen, Dirks, Duerksen, Derksen, Doerksen, Dercksen, Dyrksen, Dirssen, Dirck, Dircks, Derks) family|Dirks]], [[Funk (Funck) family|Funck]], [[Janzen (Jantzen, Janssen, Jansson, Jansen, Johnson, Jansz, Janz, Jantz, Jans) family|Jantz]], [[Isaac (Isaak, Isac) family|Isaak]], [[Koehn (Könn, Koen, Kuehn, Kien, Kane) family|Koehn]], [[Nachtigal (Nachtegaal) family|Nachtigahl]], [[Pancratz|Pankratz]], [[Penner family name|Penner]], [[Ratzlaff family|Ratzlaff]], Richert, [[Schellenberg (Schellenbarg, Schöllenbarg, Schellingbarg, Schellenberger) family|Schellenberger]], [[Wedel (Wedell, Weedel, Wedler, Wiedel, Wadel) family |Wedel]], [[Frey (Frei, Fry) family|Frey]], [[Schmidt (Schmid, Smit, Smet, Schmitt, Smith) family|Schmidt]], Sperling, [[Unruh (Unru, Unrau, Onrouw) family|Unrau]] and [[Voth (Vooth, Voodt, Vodt, Voht, Voet, Vogt, Foht, Foth, Fogt, Fodt, Foot) family|Voth]]. Most of these names are still common in the Alexanderwohl community in Kansas. From the reference to "Old Flemish" or "Groninger Mennonites" one is not to understand that the congregation came in a body from the [[Netherlands|Netherlands]], but this indicates that it was affiliated with the [[Flemish Mennonites|Flemish]] rather than the [[Frisian Mennonites|Frisian]] conference. The "Old" indicates that the congregation originally had very conservative leanings. According to the names, some of the original members must have come from the Netherlands, some from the neighboring Lutherans, and one, Schellenberger, from the [[Hutterian Brethren (Hutterische Brüder)|Hutterian Brethren]]. Source: Mennonite Church USA Archives - North Newton: 2004-0093. Dyck, A. J. “Hoffnungsau in Kansas.” Mennonite Life (October 1949): 18-19, 46. Krahn, Cornelius and Glenn Penner. "Alexanderwohl (Molotschna Mennonite Settlement, Zaporizhia Oblast, Ukraine)." Global Anabaptist Mennonite Encyclopedia Online. March 2011. Web. 23 Apr 2019. http://gameo.org/index.php?title=Alexanderwohl_(Molotschna_Mennonite_Settlement,_Zaporizhia_Oblast,_Ukraine)&oldid=118803. Krahn, Cornelius and Glenn Penner. (March 2011). Alexanderwohl (Molotschna Mennonite Settlement, Zaporizhia Oblast, Ukraine). Global Anabaptist Mennonite Encyclopedia Online. Retrieved 23 April 2019, from http://gameo.org/index.php?title=Alexanderwohl_(Molotschna_Mennonite_Settlement,_Zaporizhia_Oblast,_Ukraine)&oldid=118803.